The spill prompted residents of Liuzhou, a city of 3.2 million in southwestern China's Guangxi region, to stock up on bottled water, though officials said efforts to neutralize the cadmium were keeping the water within safe levels and the city could use groundwater reserves if water from local rivers and reservoirs becomes too contaminated. Chinese rivers, lakes and coastal waters are heavily polluted due to inadequate controls on industries, runoff from farms and urban sewage. 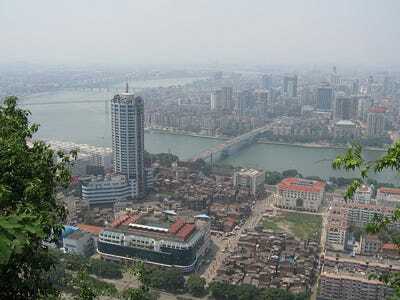 The area near Hechi, the city upstream on the Longjiang River, where the cadmium was first detected, has seen repeated spills from smelters and miners operating in the area. Many rural areas of central and southern China are heavily dependent on mining and smelting. Polluters are often state-owned companies with strong political influence that makes enforcement of pollution controls difficult at the local level despite top-level government pledges to improve environmental protection. The Guangxi Jinhe Mining Co. initially was reported to be the suspected main cause of the contamination because its waste disposal continually failed to meet government standards despite repeated citations, the newspaper China Business News reported. According to industry websites, the company, a subsidiary of Guangxi Nonferrous Metals Group, makes zinc ingots and zinc oxide used as white pigment for rubber, cosmetics, medicine, ceramics and glass. Cadmium naturally occurs in zinc ore and is a toxic byproduct of smelting. But Feng Zhennian, a regional environmental official, named only one company — Jinchengjiang Hongquan Lithopone Material Co. Ltd. in Hechi, in announcing the detention of the seven chemical company managers, Xinhua reported. Feng mentioned no other companies and did not name those detained, it said. Lithopone is a mixture of barium sulfate and zinc sulfide that also is used as a white pigment. The cadmium had polluted a 100 kilometer (60-mile) stretch of the Longjiang River at a level more than five times the official limit of 0.005 milligrams per liter, the official Xinhua News Agency reported Monday. "It is a critical time right now as downstream drinking water safety is in jeopardy, so we will take every measure possible and optimize our strategies to bring down cadmium concentration levels," it quoted He Xinxing, Hechi's mayor, as saying. TV reports and photos showed soldiers dumping into the river bags of bright yellow aluminum chloride, a neutralizing agent, into the river. Seven factories and mines handling heavy metals were ordered to suspend operations as a precaution, according to reports on the website of the Ministry of Environmental Protection. Top level provincial officials cited in those reports said that chemicals dumped into the river had helped reduce the cadmium contamination to safer levels, though some communities living near the spill were relying on barrels of water trucked in by the government. Hechi and the surrounding area have been repeatedly singled out for inadequate controls on pollution by cadmium, lead, arsenic and other heavy metals. In 2006, a local "cleanup" campaign involving thousands of people, that did little more than move rocks from mine tailings around, drew national attention after some participants complained. China has set a goal of reducing pollution by lead, mercury, chromium, cadmium and arsenic by 15 percent of 2007 levels by 2015. Researcher Zhao Liang in Beijing contributed.